If you’re missing teeth, you’ve probably told others that you’re lucky that it’s not very visible. Sure, you don’t have to worry about smiling in pictures or anyone passing judgements based on your smile, but did you know that failing to replace missing teeth has huge implications for your oral health? Essential functions that you rely on a daily basis are at risk if back teeth are missing. To learn what’s at stake and how dental implants can help, keep reading! When we’re talking about back teeth, we’re really talking about the molars and premolars that are generally less visible in your smile. These teeth play a huge role in grinding and chewing, but they also make a big difference when it comes to your bite. Teeth are all meant to function as one unit, so if one tooth disappears, that unit is disrupted and as a result not as effective as it could be. For example, back teeth work to even out force while chewing, preventing excessive force on the front teeth which are more vulnerable due to their shape. As a result, chewing is more difficult and neighboring teeth are at much higher risk of erosion. Furthermore, just because teeth are missing in less visible areas doesn’t mean your face won’t begin to change shape regardless. Missing teeth can eventually decrease facial height, meaning your face will begin to sag prematurely. When teeth are missing, neighboring teeth will naturally begin to take up that open space in order to compensate. 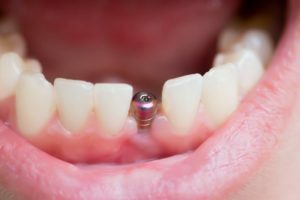 While this will obviously take a toll on the alignment of your bite, it also affects the alveolar bone, jaw muscles and surrounding tissue underneath the crown itself. As teeth begin to shift, their roots will begin migrating as well. Eventually, these teeth will lose function because they are no longer properly seated in the alveolar bone. Additionally, symptoms of temporomandibular joint disorder (TMD) can start to appear as the distribution of force becomes more uneven. This added stress on this joint will cause jaw pain, headaches, earaches, clicking and popping of the jaw and a generally lower quality of life. Luckily, there is a way to handle tooth loss at its source. Unlike traditional bridges or dentures, dental implants can prevent all the negative side effects of tooth loss, including those that would affect appearance. By integrating with your existing bone and gum tissue, dental implants become a natural part of your smile once they’ve fully healed. By the end of treatment, they become indistinguishable from your real teeth in both function and aesthetics. With such an advanced dental treatment available, it’s worth it to schedule an appointment with an implant dentist who can go over the process in more detail! Dr. C.J. Landry earned his DDS degree from the LSU School of Dentistry. On top of this dental education, he’s taken thousands of hours of continuing education courses, including on dental implant surgery and restoration. To learn how you can prevent the inevitable side effects of tooth loss, you can contact him through his website.